The cannabis industry is likely to grow over the next several years as more states in the US legalize marijuana. However publicly traded cannabis companies trade at bubble price/sales valuation of 85x. Constellation Brands is reasonably priced and is an attractive back door play on the cannabis space. Cannabis stocks have been on a tear the last two years, and many investors are excited about the prospects for the industry. 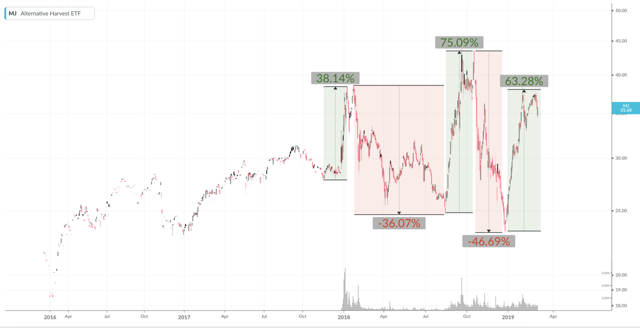 The Cannabis ETF (MJ) is up 72% since the ETF launched at the end of 2016, and has outperformed the S&P 500 return of 43% and Nasdaq return of 61%. Legalization across the US, Canada, and other countries is creating optimism that early-stage companies in the sector can reap big rewards as the industry matures and cannabis becomes a mainstream consumer product like beer or soda. The growth projections are certainly optimistic that this happen. According to BDS Analytics, global sales of cannabis will expand to $146.4 billion in 2025 from $16.9 billion in 2019, a CAGR of 35%. Consumption of marijuana is noticeably becoming mainstream. Walk a block in midtown Manhattan and it’s hard not to inhale a breath of secondhand smoke. The industry will surely grow on a macro level, but whether the stocks are investable is a different story. 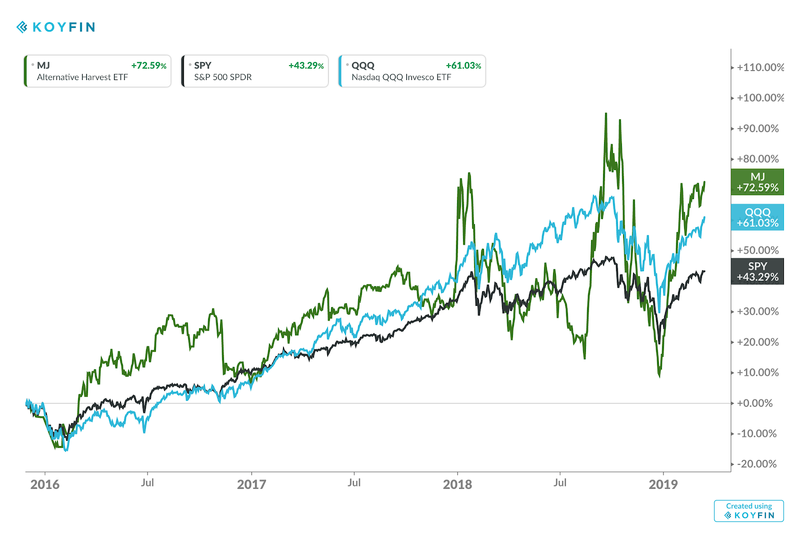 Incorporating even the most optimistic assumptions about future growth, the industry is trading at nosebleed valuations. The total market cap of all marijuana stocks in the US and Canada is about $50 billion, despite sales of only $580 million. That translates to a price/sales multiple of 85x. To put that in perspective, highly valued and hyper growth tech stocks like Zscaler (ZS), Okta (OKTA) and Atlassian (TEAM) trade at 20 - 30x price/sales. 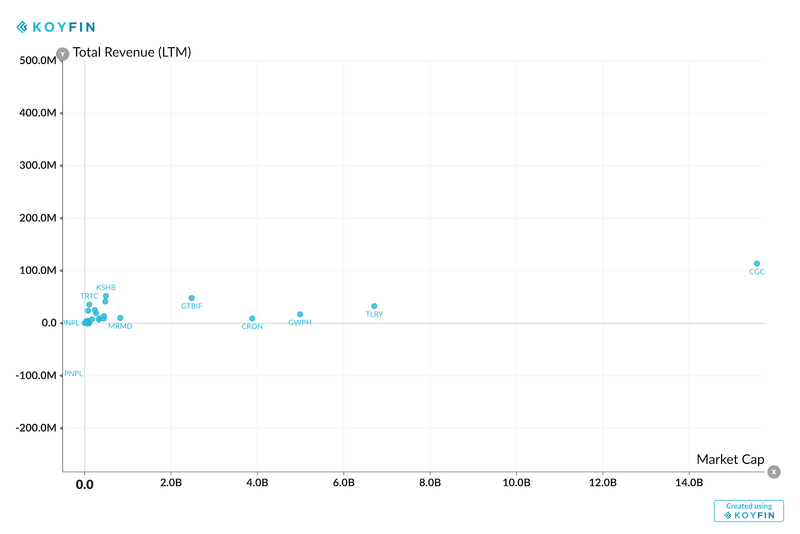 None of the cannabis stocks have positive earnings or EBITDA. Even if the industry’s sales grow as quickly as projected, the profitability of individual companies is unknown. Increased competition will certainly eat away at profits as the sector matures, and it’s unclear if there’s any first mover advantage. To the extent cannabis stocks become consumer companies, their profit growth will be capped by high marginal costs. An additional unit sold is accompanied by higher costs, unlike in tech where marginal costs are much lower and sometimes close to 0. In a February 2019 interview with Yahoo Finance, co-founder and CEO of Canopy Growth, Bruce Linton has a sobering assessment of the industry’s valuation. The regulatory and tax structure also adds to the uncertainty in the sector, with further concerns about how much taxes will eat into profits. In California for example, legal cannabis sales in 2018 were $3b, which is $0.5b lower than in 2017, as many consumers bought cheaper cannabis on the black market where taxes don’t add to the cost. Across the country, varying state regulations have led to wildly different prices. A pound of marijuana costs $1,183 ($74 per ounce) in California, while in Illinois it costs $3,044. The Aurora Cannabis CEO Michael Singer recently claimed that his company may enter into sectors such as food, beverage, consumer goods, beauty, and health care. With only $42m in sales, the company can easily paint a rosy picture (with a green tint) of future prospects. The company needs to deliver on this promise and execute perfectly if it wants to support its $6.7B market cap. The stretched valuations and uncertainty have resulted in a wild ride for cannabis stocks. 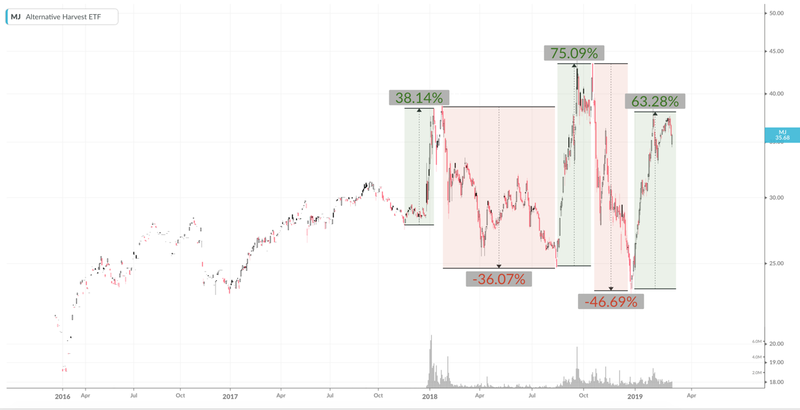 Over the past 18 months the MJ ETF has had three rallies > 40% and two sell-offs more than 35%. Based on this pattern, the next move is likely down in the near term to the $25-$30 range. Short interest in the ETF is around 9% of shares outstanding, which is near the high since inception. Also interestingly short interest previously declined as the ETF made new highs. 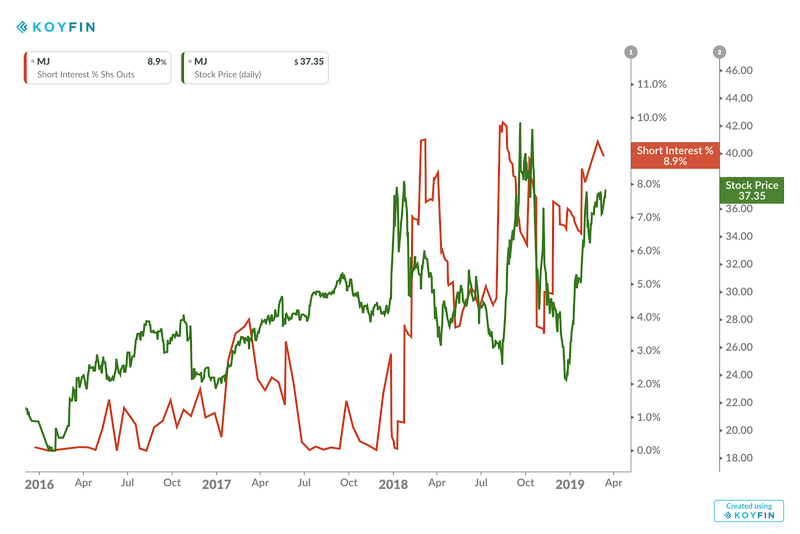 This is different from today where the ETF has rallied 60% from its low in December but short interest has remained elevated. For investors that want to be long the cannabis theme, there are few reasonable options. As discussed, on an industry level the valuations are too inflated. 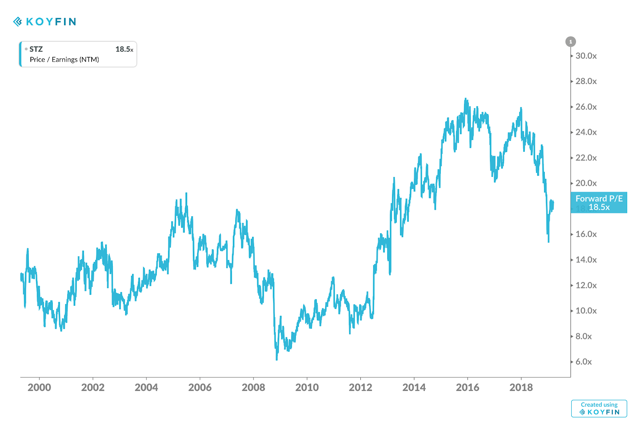 On a single stock level, Constellation Brands (STZ) is an indirect play on the cannabis theme, which seems reasonably valued. STZ is one of the largest beer and wine distributors in the world with brands such as Corona and Modelo. Recently, STZ planted its flag in the cannabis space with an equity investment in Canopy Growth (CGC). The deal making started in October 2017 when it paid $190 million for a 10% stake in CGC. In June 2018, STZ bought a $450 million convertible note and in October 2018, the company paid $3.8 billion to increase its stake to 38%, with optionality to increase its ownership to 50% in the future. STZ evidently has its sights on the cannabis industry with a large balance sheet. It’s exciting to watch how the cannabis industry will develop over the next several years. The inflated valuation of the stocks makes for poor risk/reward of buying the traditional cannabis stocks. Until valuations come down and there’s more certainty around regulation, investors should puff puff pass.